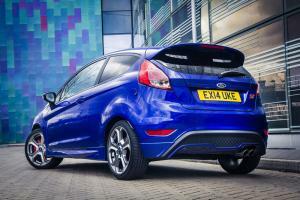 Ford has added a new ST3 model to its Fiesta ST range. Priced at £19,250, the ST3 adds cruise control, climate control, automatic headlights and wipers, keyless entry, auto-dipping rear-view mirror, power folding door mirrors and Sony DAB stereo with satellite navigation over and above the specification of the existing ST2 model. Parking sensors can now also be added to both the ST2 and ST3 for £250 extra. 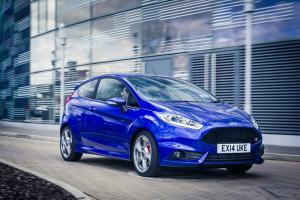 Ford says they’ve sold 6,250 Fiesta STs since it was launched a year ago, beating their forecasts by 20%. The company goes on to say that 90% of buyers have so far plumped for the ST2 grade. The Fiesta ST3 continues to be powered by the same 1.6-litre EcoBoost petrol engine with 182PS, mated to a six-speed manual gearbox. It can sprint from 0-62mph in 6.9 seconds and on to a 139mph top speed, while achieving 47.9mpg on the combined cycle with CO2 emissions of 138 g/km. It’s available in a choice of five colours – Frozen White, Race Red, Panther Black, Spirit Blue and Molten Orange – with either a Molten Orange or Smoke Storm interior. Want to know more? Read our Fiesta ST review.